Hi everyone! 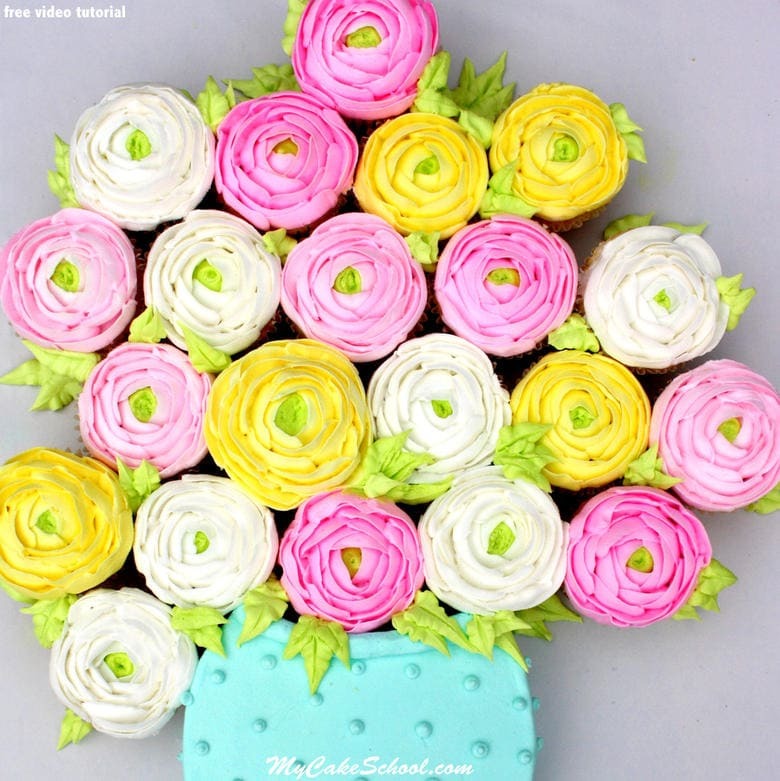 In this free cake video tutorial you will learn how to pipe buttercream ranunculus cupcakes! These delicate flowers with their tightly layered petals are not difficult to replicate in buttercream as long as you have a petal tip on hand. These piped flowers are surprisingly simple to create, but look so impressive! Whether you are piping them on cupcakes or onto a freshly frosted cake, they are sure to take your decorating to a new level! I find that the only thing prettier than one buttercream ranunculus is a bunch of them. So that’s what we made–and ours are on cupcakes! Our secret weapon today is a curved petal tip. You could use the usual 104 tips with these also, but I feel like the curved petal tip will give you a little bit of an edge in recreating the ranunculus petals. In this video, I am frosting white almond sour cream cupcakes with our Fluffy Vanilla Buttercream Frosting. Any frosting will do as long as it holds its shape nicely. Ours was a medium consistency. We also used a one layer six inch round for our “vase”. Paintbrush– (optional) I used for little details–texturing the centers, tapping down crusted buttercream here and there, etc. Cake Base- We used a masonite board wrapped with a plastic tablecloth and taped underneath with heavy duty tape. You’ll notice that in my final photo, there are a lot more leaves! After finishing the video, I was taking photos and decided to add a few more leaves here and there…and before I knew it, I filled every gap;0) –I think the flowers looked great even without all of those leaves, but the gaps between cupcakes began to jump out at me and so I filled them! Also, you may notice that I wiped my petal tip off just about every time I piped a petal. I didn’t realize how often I was doing this until I watched the video ;0) –This was probably excessive, don’t feel that you have to clean your tip so often. Just keep an eye out for icing buildup on your tip and give it a swipe now and then. Thanks for stopping by–If you give the buttercream ranunculus flowers a try, I hope you’ll share the pictures with us! I love these flowers and they look great in BC too. Is it possible doing them in fondant? It is so funny that you made these this week. This past weekend I worked for my friend who owns a bakery making butter cream flower cupcakes for a baby shower. I piped flowers on cupcakes that you demonstrated on another video. They turned out great. We were trying to think of an additional flower to pipe. I was wishing I could make “roses” just like the Ranunculus you just demonstrated. I didn’t know what they were called. I am thinking about making this for a Mother’s Day gathering. The little kids would love the cupcakes. Thank you all so much for your comments! @Wanda & Asanka– Yay! Glad that you are planning to make them! I just made for a bithday bouquet and posted yesterday, but with different flowers as I did not have the correct tip. I also posted on cake central and to my surprise it became one of the favorites! (First time that has EVER happened. )Thanks Melissa, you truely are an inspiration. Wowwwwwwwwwwwwwwwwwwwwwww me encanta!!!! your the best!!! esta flor es mi preferida y estos cupcakes los haré ya!!!! gracias!!!! @Colleen, that is so great! Congratulations! — @Ilsa– thank you!! Melissa, do you think a 4″ pan and mini cupcakes will work? Or are the mini cupcakes too small? absoluty love :) what size board did you use please I would love to make this for work (Easter celebration). If I counted correctly approx 2 dz cup cakes? Keep up the great work..love all your creations! Hi, I think that masonite board was 24 x 30, crazy but I can’t find it now. Home improvement stores such as Home Depot sells pre cut plywood boards that are 24 x 24 that you could use also. Having trouble opening up video on ranunculus.Help! Love this idea. One of us has a blog and she loves your ideas for her blog but they ALWAYS turn out different. You make it look easy. I am assuming you could pipe this on a nail and let crust then transfer to a cake? I have a cake I am making and they want buttercream ranunculus. Any other ideas? Hi heidilynn, yes, pipe on a rose nail let crust ( should only take about 10 minutes) You could speed things up by putting a dot of buttercream on top of the rose nail, stick a small square of waxed paper to that, pipe the ranunculus on the waxed paper and remove to crust while making more ranunculus. You could also let them dry for a day, then transfer to the cake attaching with a small dot of buttercream. 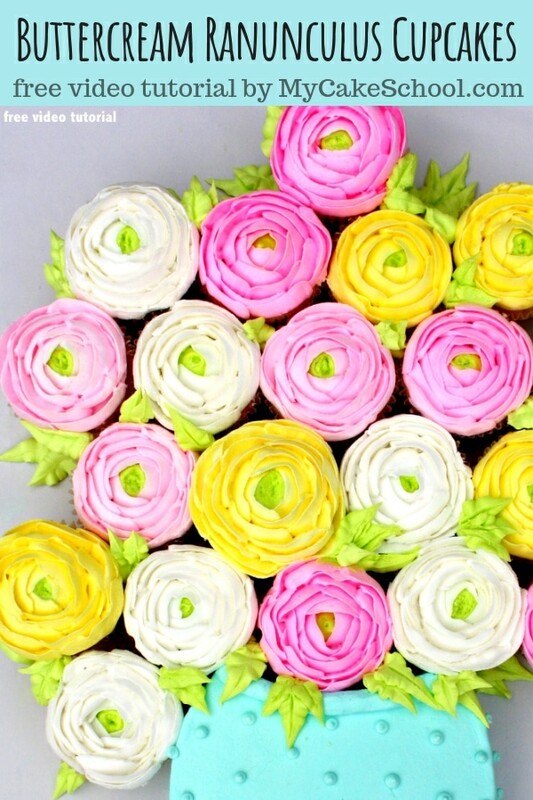 In the video, I think Melissa is piping these on cupcakes, you might need to put a circle of buttercream onto the rose nail (or waxed paper) so your first ranunculus petal will have something to stick to…….in the video, the tops of the cupcakes were frosted before Melissa started piping the ranunculus. Hope all this is clear. Do you think that Swiss Meringue BC would work? The one I use does have butter as well as shortening and powdered sugar. Thanks again for the wonderful video and great ideas. Hi Leslie, Melissa and I have not tried using SMBC to pipe ranunculus, thinking it would be too soft. Since your recipe has butter as well as shortening the consistency my be better for piping. Would you do a tutorial on piping rununculus onto a flower nail? Somehow when I try to do them on a nail they end up looking a little more like a rose than rununculus. Thanks! I love all your tutorials but am particularly fond of the flowers! Hi Hina, You could use the Classic Vanilla Buttercream or Fluffy Buttercream recipe found in the recipe section. If needed, add more confectioners sugar to get the piping consistency you like.